Although the beat-em-up genre has been pretty decently represented this generation thanks to some re-releases and remakes in digital form–Double Dragon Neon and Teenage Mutant Ninja Turtles: Turtles In Time Re-Shelled come immediately to mind–it's accurate to say that the genre has remained on life support and is still awaiting a full resurgence. 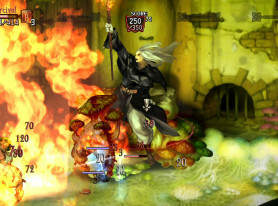 The first appearance of Dragon's Crown at E3 2011 was a highlight of what was admittedly a pretty weak E3 altogether, and the first real sign that things would get better for the genre that Double Dragon built, but only now, courtesy of Atlus, are we finally getting our hands on Vanillaware's years-long labor of love. The story begins nearly 20 years ago, when a team at Capcom turned out a pair of fantastic Dungeons & Dragons-branded beat-em-ups for the CPS2 arcade system, Tower of Doom and Shadow Over Mystara. (Conveniently enough, said games just recently made their first North American appearance outside arcades on PS3, 360, Wii U, and Steam, and make an ideal companion piece to Dragon's Crown.) Despite the quality of the games themselves, the arcade medium they were delivered upon was a bottleneck unto itself. They were very much arcade games in scope, meaning a steady enough supply of quarters could show you everything they had to offer in an afternoon, and there was no way to build up a character since arcades would not embrace data cards for several more years. 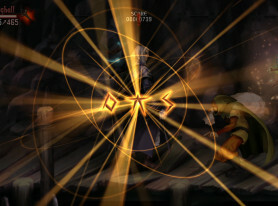 In essence, Dragon's Crown is a spiritual sequel to Tower of Doom and Shadow Over Mystara, absolutely gorging itself on the same essence of multiplayer beat-em-ups that fueled its predecessors so effectively, while taking advantage of all the benefits of modern console gaming to pull every last drop of untapped potential out of the original idea. You create your character by choosing one of six classes, divided up simply enough into "Normal" and "Expert" categories. Due largely to the fact that it uses 2D sprites, your design options fall squarely on the side of the beat-em-up as opposed to multiplayer RPGs. Your character's gender and overall look is determined entirely by what class you selected; the only wiggle room you get comes from selecting one of a handful of character palettes, and of course what equipment you have at any given time. Don't take that as a deterrent, however. The six character classes have an utterly insane diversity about them, far more than any beat-em-up has ever offered up before. Starting a new character in a class you haven't yet played feels a lot like picking up a new character in a well-made fighting game, it's like learning an entirely new game, and adds a whole new level of replayability to a genre often written off as being repetitive. Moreover, the sprites are so beautifully drawn and animated that sometimes it's easy to mistake the character sprites for carefully-shaded 3D models, and the gorgeous backgrounds hold up their end of the bargain and then some. The only complaint there is that there can be so much going on that animates so fluidly that it can be easy to lose track of your character in the heat of battle, even despite the colored arrow indicating your position. 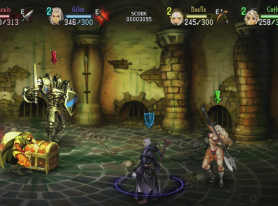 The bulk of Dragon's Crown plays out across nine different stages, but the game never really feels all that repetitive, because there's always so much to do within those stages when you factor in sidequests and routes. Once you've made your way through all nine stages the first time, the game opens up considerably, with a particular emphasis on marathon play. That is, once you clear a stage, you can opt to continue playing stages selected at random rather than return to town, piling up cumulative bonuses to gold value, EXP value, treasure quality, and enemy drop rates for every stage you clear. You have to keep an eye on your equipment durability, but if you're well-prepared, a good Dragon's Crown binge will yield numerous perks. 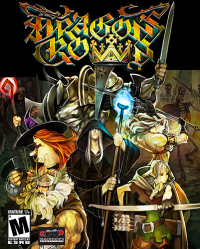 Despite the remakes, re-releases, and various other swings-and-misses we've seen in recent years, Dragon's Crown actually makes good on the promise of bringing back the beat-em-up, and it does so in much the same way Borderlands revitalized the first-person shooter. Specifically, it takes a time-honored, tried-and-true multiplayer concept, then injects replay value by the truckload alongside the eternal search for superior gear. Even then, this whole project could have gone horribly wrong rather easily, but the team at Vanillaware managed to come up with enough gameplay diversity to avoid any of those pitfalls. Due to some clever design, even the main quest by itself will last you for several trips through the game's dungeons. Add in the various quests, puzzles, and of course, preparation for the tougher challenges you'll face along the way, and you already have a game that, despite its genre, stands up well next to some of the best RPGs of this generation. Every time boredom even suggests that it might start setting in, you'll finally have that "a ha" moment that polishes off a big quest, pick up and fall in love with a new character class, or come back from a ten-stage marathon with a bagful of amazing gear. From there, you have New Game +, which at this point is self-explanatory. This puts the amount of time you can spend with Dragon's Crown in the same class as your typical Elder Scrolls title. That's not to say the game is spotless. Yes, its flaws are very few, but to be fair, they're pretty glaring. The most obvious is the lack of a pause function, which is only circumvented on the PlayStation Vita due to the PS button acting as an auto-pause of sorts. Not brilliant if you're in a multiplayer game, as doing this will kick you out of it, but it's an effective way to call time-out during single-player games, and you definitely miss it in the PS3 version. Also annoying is the point-and-click mechanic, with which you use the right analog stick to spot small treasures in the background and order your lackey, Rannie, to open up doors and treasure chests. Again, not so bad on the Vita where the you have the option of using the touch screen to mitigate that awkwardness (it almost makes it feel like Dragon's Crown was developed primarily as a Vita game, rather than for PS3), but even there it's annoying, and on the PS3 it's downright cumbersome. Slightly less egregious, while still odd, is the lack of cross-buy for a major title like this that has a cross-save feature and could give the PlayStation Vita a much-needed jolt. As it stands, you're looking at a $90 buy-in to get the best of both worlds, allowing you to play Dragon's Crown on your TV and take some of the best multiplayer around with you on the go. The fact remains that it truly is some of the best multiplayer around, and in a form that we've been deprived of for far too long. With due respect to some of the truly great franchises of the past (hello there Final Fight, Golden Axe, Double Dragon), Dragon's Crown has a gameplay depth, replay value, and variety of things to do that come together extremely well to put it leaps and bounds above any other beat-em-up produced. Considering its massive development cycle, and a release corresponding with a generational transition, it's safe to say we won't be seeing a sequel anytime soon. The frightening and awesome thing is that Dragon's Crown has enough staying power to last, quite possibly, however long that wait might be. Weekly Dragon's Crown nights could easily be one of the greatest contributions gaming has made this generation. Rune magic is everywhere. One of the first things you should do is save up for the 48,000 gold worth of rune stones that will enable you to fully exploit the runes you find out in the field. Boss battles are really quite epic, and in many cases, involve more particular strategies than simply beating down on a large target. 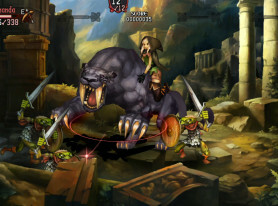 The ability to ride certain defeated monsters is just one of Dragon’s Crown’s well-placed nods to Golden Axe. Fire is particularly effective to use against fungal enemies. Don’t worry, despite being a pain to control at times, Rannie makes for a remarkably competent companion.